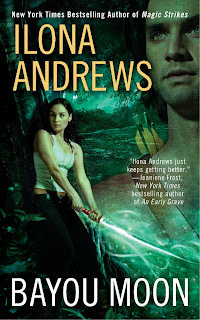 I was absolutely delighted when I heard that Ilona Andrews had signed a contract for more Edge books. I was even more delighted when a review copy landed in my lap. I read On the Edge last year and was completely swallowed up by the world of the Weird, the Broken, and the Edge. I loved Rose and her rifle and her precocious and wild little brothers. Declan the blueblood grew on me and I finished it crossing my fingers for more from that world. When I learned that Bayou Moon would follow William--Declan's sometime brother-in-arms, and sometime enemy, I did my little dance of joy. I'd always like William. He was lethal and unrefined, where Declan was dripping with stiffness and honor. Just more my kind of guy, you know? I wondered who he would find and how they would get on. I'd liked Rose so much and I wanted William happy. There. I said it. I also like this cover better than the first one. William's not so "here I am in all my glory" as the dude on the cover of On the Edge . Also. He has arrows, which as you know equals awesome. And Cerise looks wary and capable in a very Kate-like way. These things boded well. William is still hanging out in the Edge. He's working his nothing job, living in his dump of a trailer, and kind of wishing it would all just end soon and he'd be suddenly and effectively put out of his misery. But he's got one last mission to perform. And it is one he intends to pull off flawlessly and with the ruthless precision he became known for during his time in the Red Legion. The elite mercenary known as Spider is creating an army of mutants and serving as spymaster for Adrianglia's rival nation in the Weird. So William is called up to spy on the master, discover his plans, and bring him down at all cost. Having crossed swords with the vicious Spider several times before, William is more than happy to oblige. He'd like nothing more than to rid the world of that psychopath once and for all. While on his way into the portion of the Edge known as the Mire, William encounters Cerise Mar. Nominal head of her clan, Cerise is on her own quest to find her missing parents and save her ancestral home from their neighboring clan whose been at their throats for ages upon ages. Since William is fairly certain Spider is behind the abduction of Cerise's parents, and since Cerise knows the ins and outs of the Mire like the back of her hand and can guide him through them, he attaches himself to her--against her will, I might add--and the two of them set off through the swampy wasteland to track down a killer. Bayou Moon is even wilder than its predecessor, if you can believe it. And since, in many ways, William and Cerise are wilder than Declan and Rose, I relished how the landscape, the villain, and the entire storyline reflected that. The Mire is the grim and grimy underbelly of the Edge and I literally had no idea what unholy creature would turn up next to block their path. I couldn't help but enjoy watching Cerise guide big, bad William through her homeland and take a little pleasure in watching him squirm at the most outrageous and intricate ways the clans have developed to eke out an existence in such a place. I liked Cerise from the very beginning. But then I was predisposed to as she is tough and determined and recognizes William's value. The narrative alternates between William, Cerise, and Spider's experiences and I will say I almost cringed every time it switched to Spider. The dude is the real thing--absolutely heinous and it was hard to watch him twist and pervert those around him in pursuit of his cause. I dreaded their final meeting and looked forward to the few moments of happiness allowed these characters here and there. Fortunately the bond between William and Cerise is the real thing as well and I worried over them (and loved them) as much as I hated the villain. The Mars as a group are an extremely varied and strong supporting cast of characters and I eagerly got to know each of them as William did. Introducing your family to new people is always an interesting and sometimes thorny endeavor and I thought this was a particularly strong aspect of the novel, especially as it so effectively humanized Cerise and showed us why she was the way she was. I enjoyed catching glimpses of old characters, while keeping the focus on William and Cerise and making room in my affections for a few new ones who I hope to see again soon in future books. Bayou Moon struck me as a stronger, darker, meatier installment in the series and I had no trouble whatsoever giving myself over to its sinister charms. Bayou Moon is due out September 28th. What a great review! I LOVED On the Edge, and now I'm looking forward to this next one even more. I've heard such good things about Ilona Andrews. I haven't read anything by her yet, but Magic Bites is on it's way to me from the library so I'm excited to check her out! I can't wait to read this book and already have my copy preordered. So far books by Ilona Andrews have never disappointed me. Great review :) I've so far only read one book by Ilona Andrews ans that is Magic Bites I should continue with her books I think. I loved this one..possibly more than On the Edge. William and Cerise are awesome! I'm SO excited to read this one..I read your review with one eye open....I'll be back after I read it!! Brilliant review, Angie! So glad that you really liked this one. I can't wait to read it. It looks like I need to start bugging the local bookstore next week to ask for a copy of this. I loved On the Edge and this one looks even better. I'm not very far in but liking it so far. Can't wait to finish it now! I do agree that this cover is an improvement over the first. I love the overall coloring and depiction of William. I have On the Edge checked out from the library right now, and I'm hoping to get to it soon. Glad you enjoyed this one, too! Yes! I liked ON THE EDGE, but I LOVED This one. And you nailed it, it's a little darker but to me infinitely more likable. I never could really take Declan seriously for some reason. But William? Him, I'm a big fan of. Anna, oh good! Then you will adore this one, I think. Erin, ooooh. I'm jealous. So much win in store for you! Ladybug, definitely do. It was the next one--MAGIC BURNS--that clinched it for me. I haven't looked back since. Heather, me too! Those two were awesome. Ari, I know. It's so hard to give yourself over to new characters when you just want to spend more time with the older ones. Chachic, I thought it was. I'm anxious to hear your thoughts. Holly, definitely an improvement. But then William is one over Declan IMO as well. Michelle, I'm glad. Big fans of William are we.